MANILA — An overwhelming emotion filled the court room as the verdict against retired Maj. Gen. Jovito Palparan, and two other Army officials was read. All three – Palparan, Col. Felipe Anotado, and Staff Sgt. Edgardo Osorio – were convicted of two counts of kidnapping and serious illegal detention over the enforced disappearance of two students Karen Empeno and Sherlyn Cadapan who were forcibly abducted more than 12 years ago. But their mothers Concepcion and Erlinda were not the only ones shedding a tear over what they refer to as an initial victory in their painful journey of looking for their disappeared daughters. 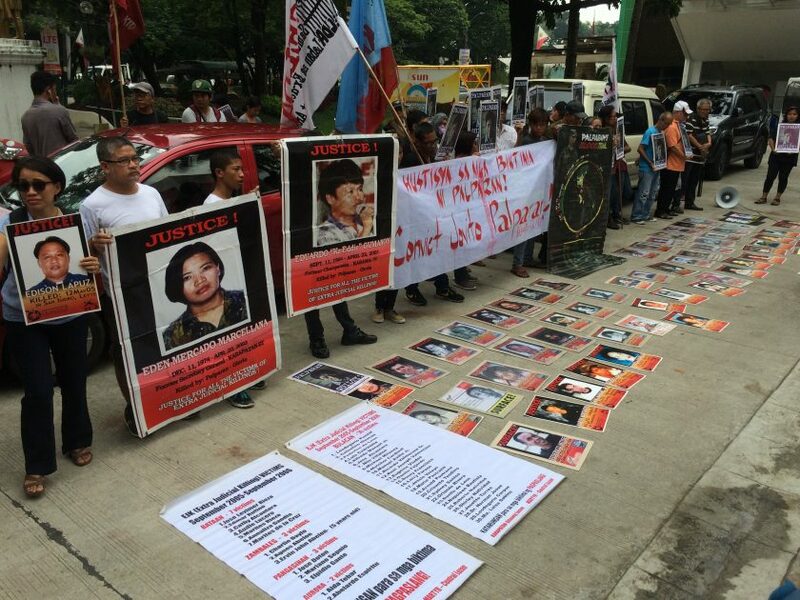 Outside the courtroom, victims of the bloody war that Palparan waged as the posterboy of Oplan Bantay Laya 1 and 2, along with human rights defenders, gathered for a protest action. Tears and cheers greeted the two mothers as they walked out of the court. “Para akong nabunutan ng tinik, (I feel like a thorn was removed from my side.) “ said Orly Marcellana, husband of the slain human rights activist Eden Marcellana, who was killed during the reign of Palparan in Mindoro. The likes of Marcellana, whose loved ones have fallen victims to gross and brazen human rights violations under former president Gloria Macapagal Arroyo, found Palparan’s conviction as a vindication and justice that they have long been struggling for. They have waited long and hard for this day to come. “Dapat mabulok siya sa kulungan hanggang sa mangamoy lupa siya. Pagdusahan mo ang mga ginawa mo sa mga mahal namin sa buhay, (He should rot in jail. He should suffer for what he did to our loved ones. )” said Marcellana during the protest action. Peter Gonzales, known to most as Tata Pido, could not help but relive Palparan’s reign of terror in the Southern Tagalog region. “I am just lucky. I could have been one of the photos there,” he jested when he spoke during tha rally in front of the Bulacan court, referring to the dozens of photos of victims of human rights violations under Arroyo. Gonzales later told Bulatlat in an interview that he knew that once Palparan was “done” with Mindoro, he will set his eyes in other provinces of the region. Meanwhile, Neil Dollente is still enraged whenever he remembers how Palparan’s men burned down their home in San Jose, Nueva Ecija. “One evening in August 2006, soldiers burned down our house. We were not home at that time and my mother fortunately was able to escape. We sought sanctuary and have not returned to our community ever since,” Dollente said. Palparan, he added, did not only displace him and his family but also kept them from their livelihoods. Gonzales said he could not help but be happy over the turnout of today’s promulgation. “This is one step forward in our struggle. It is a good and beautiful beginning,” he quipped. Mrs. Edith Burgos, mother of disappeared peasant activist Jonas Burgos, said she could not help but relate to how Erlinda and Concepcion feel. “We are mothers, after all. And I joined them in their journey. It must have been very difficult for them to read the accounts of the eyewitnesses and know the horrors that their daughters suffered,” she told told Bulatlat. Burgos said the conviction of Palparan will have a lasting impact on the human rights community. “Without these efforts, the courts would have dismissed the case just like what they did in thousands of other cases of human rights violations. Which is why this butcher’s conviction is not because of a “working” justice system in the Philippines,” Palabay said.